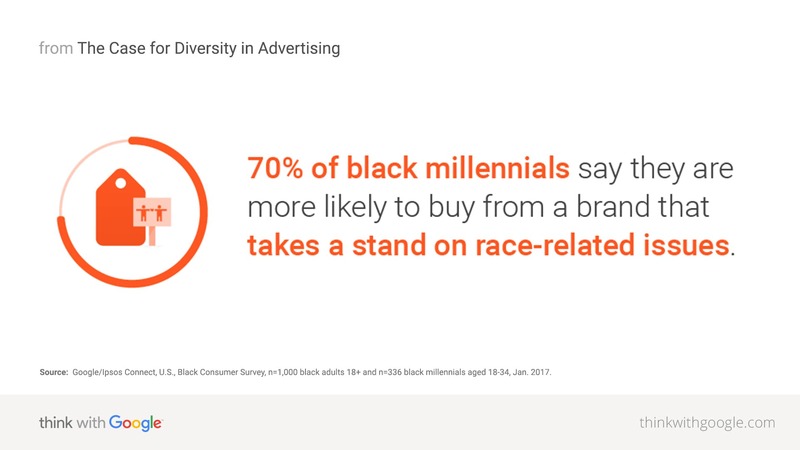 Recent research with Ipsos shows black millennials want to see more inclusive advertising that supports more diverse media. YouTube's Director of Diverse Marketing Oona King challenges advertisers to meet their expectations, while making the business case for diversity in advertising. In 1976, President Gerald Ford decreed Black History Month a national observance. In celebrating it, he said, "We can seize the opportunity to honor the too-often neglected accomplishments of black Americans in every area of endeavor throughout our history." For decades, advertisers had been among those "neglecting black accomplishments." Until the '70s, as Advertising Age put it, ads in the U.S. represented blacks as "Aunt Jemimas, Uncle Bens and Rastuses—individuals subservient to whites." As we were misrepresented in ads, we were underrepresented in board rooms: In 1978, five percent of the ad industry's workforce was composed of black and Hispanic workers. I wish I could tell you how far the industry has progressed since then. But in 2014, some 36 years later, African Americans made up only 5.8% of the ad industry. Here's why that lack of progress should motivate you to make change: The demographic shift of the ad audience has far outpaced the demographic shift of the ad industry. Millennials are the most diverse generation in our nation's history: Three-quarters of Baby Boomers are white, compared to just over half of millennials. The demographic shift of the ad audience has far outpaced the demographic shift of the ad industry. As the minority becomes the majority, they are eager to see ads that openly address diversity and race-related issues. We partnered with Ipsos and Nielsen to better understand how black millennials think about media and advertising, and the results show a desire for brands to do more. I challenge more marketers to respond to these expectations and make inclusive advertising a brand imperative. Source: Google/Ipsos Connect, U.S., Black Consumer Survey, n=1,000 black adults 18+ and n=336 black millennials aged 18-34, Jan. 2017. 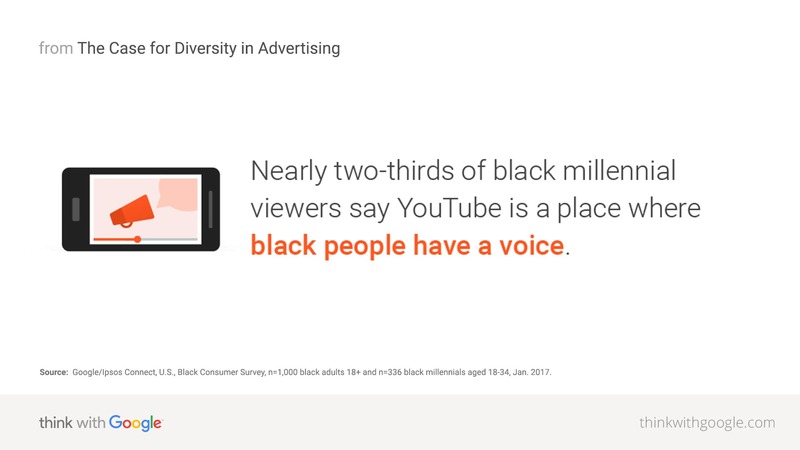 It's clear that black millennials want more diverse media and more inclusive advertising. Recent Nielsen research shows they also want to be able to watch whatever they want, wherever they want on mobile devices. Black millennials watch 73% more YouTube on mobile per person than the general population of the same age.6 Their mobile watch time has more than doubled on YouTube in the last two years.7 Brands have been prioritizing mobile for years, championing mobile-first creative and mobile-first media strategies. If advertisers are prioritizing mobile, they should prioritize inclusivity too, with the mobile black user in mind. Source: Nielsen Electronic Mobile Measurement (EMM), U.S., Sept. 2016; Nielsen Mobile Net View Custom Report, Oct. 2014. Nielsen's EMM implemented measurement enhancements in 2016. The Ipsos research suggests there might be room for advertisers to learn from those creators on inclusion. For brands interested in making more inclusive ads, we asked YouTube creators to weigh in on best practices and suggestions they'd share with advertisers. Click below to meet some of the top #YouTubeBlack creators and hear what they have to say to advertisers this Black History Month. 1,2,4,5,8 Google/Ipsos Connect, U.S., Black Consumer Survey, n=1,000 black adults 18+ and n=336 black millennials aged 18-34, Jan. 2017. 3 Nielsen Electronic Mobile Measurement (EMM), U.S., Sept. 2016. 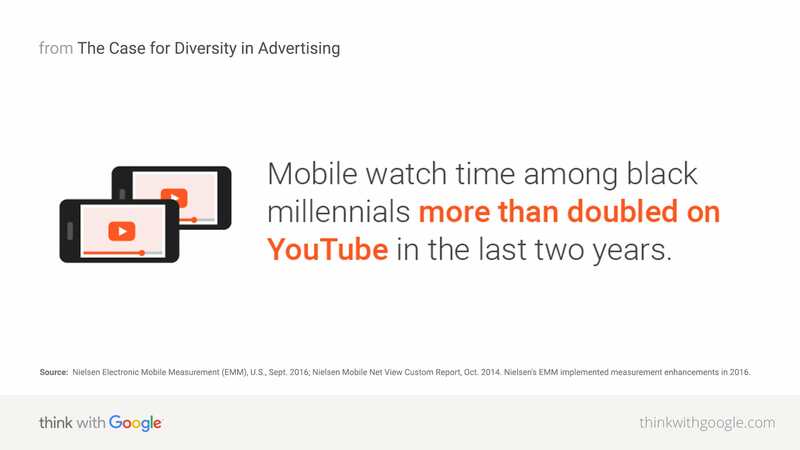 Black millennials watched 73% more YouTube mobile per person than the general population of the same age. 6 Nielsen Electronic Mobile Measurement (EMM), U.S., Sept. 2016. 7 Nielsen Electronic Mobile Measurement (EMM), U.S., Sept. 2016; Nielsen Mobile Net View Custom Report, Oct. 2014. Nielsen's EMM implemented measurement enhancements in 2016.